Remember all those Borat lawsuits, claiming that star Sacha Baron Cohen and his producers had deceived and traumatized various people — and in one case, gotten them drunk — in order to get them to humiliate themselves on camera? To quote Twin Peaks, "It is happening again." WENN and TMZ are both reporting that California woman Richelle Olson is suing Cohen (and NBC Universal) over a 2007 incident related to filming of Cohen's upcoming movie, Brüno. According to the suit, Olson (described as "elderly" in some news stories, though none we've seen so far gives her exact age) was told Cohen was a European celebrity who was interested in being a guest host at a charity bingo game she was organizing for senior citizens. When he showed up — in full regalia as loud gay fashion plate Brüno, a recurring character from Da Ali G Show — she balked. In the suit, she describes him as an "extreme, outrageous, offensive caricature of a gay man dressed in sexually revealing clothing." Objecting to his "vulgar and offensive language," she tried to take the microphone away from him, at which point she says he and his staff physically fought with her, knocked her down, and harassed her, filming her the entire time. Afterward, she fainted, hit her head, had to be hospitalized with "two brain bleeds," and has required a wheelchair ever since. No word on whether the scene is actually in the movie, whether Ken Davitian appears naked in it, or whether Olson signed a release form of the variety that so far has largely protected Cohen and his crew and producers from all the "I didn't know you were going to humiliate me on film" suits. According to The New York Times, Cohen's latest legal battle was resolved in April, when a Los Angeles court dismissed a libel case against him. Just in time for a whole new batch of ill-fated suits! 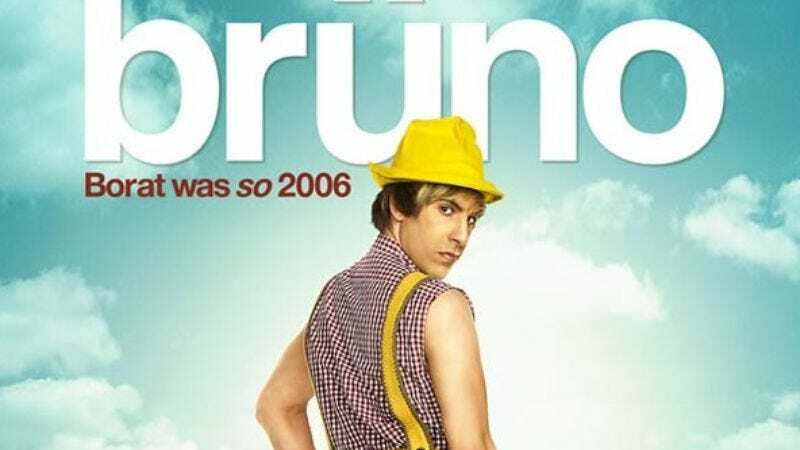 Brüno is due out July 10.